The finished massage image was used for a birthday greeting cards (with the copy “Paws & Relax…Its Your Birthday!”), as a framed matted print, on coffee mugs, tote bags and in calendars. 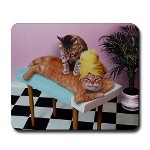 Original massage cats image created for birthday and greeting cards etc. 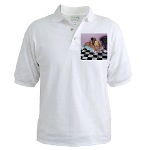 Creating a funny cat picture for use on printed merchandise such as aprons, mugs, clothing, wall clocks, mouse pads, calendars and more. The journey began with senior art director Collette Kulak. 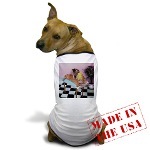 We have collaborated for many years on the Animal Antics line of greeting cards. The cards feature animals in humorous anthropomorphic poses. Every few months we would create a new batch of images for the greeting card line, and in this batch one image stood out, massage cats. We always work from a layout, and in this layout one cat was wearing a turban-wrapped towel and lay on a massage table receiving a massage from another. To create this image we have Bow Wow Productions provide us with our animal talent as well as animal trainers. We break the shoot days into prop and location days, and animal days. I shoot locations because it is generally easier to control the lighting on the animals than on the locations. I photograph the cats, dogs and other animals in my studio where I can match the lighting to that of the locations. I try to shoot in soft non-directional light as much as possible to facilitate the digital manipulation that must be done. For the Massage Cats image Collette constructed a miniature massage table. Props that needed to be photographed included the towel for the turban wrap and a decorative potted palm. We laid black and white floor tiles down on my studio floor to photograph for the massage location. When shooting cats we have the animal trainers bring two similar cats for each shot. That way if one of the cats is not feeling like being in front of the camera we can accommodate them, or, if the shoot is a long one, can “spell the talent”. The animal trainers know their cats well. They know which cats are OK with being handled and which ones don’t like it. When the layouts are completed, Collette consults with the animal trainers to insure that the right cats are available for the poses we need. We photograph each part of the cat that we will need to create a photo realistic rendition of the layout. Perhaps the most difficult aspect of the project is figuring out how to shoot the “parts” in a way that will fit the layout. To have the cat have the same pose as a human would, when their joints don’t articulate in the same way, can be very challenging. And there is nothing worse than being half way through the digital imaging process only to realize that you don’t have the right raw materials! 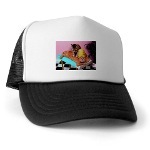 I do the imaging with Photoshop. Most images take about a day to complete and can have anywhere between five and fifteen or even as many as twenty or more photos. In one image, a shot of two cats wrestling in front of an audience of cats, I ended up with over 100 parts. The finished massage image was used for a birthday greeting cards (with the copy “Paws & Relax…Its Your Birthday!”), as a framed matted print, on coffee mugs, tote bags and in calendars. But the use of that image apparently doesn’t stop there. 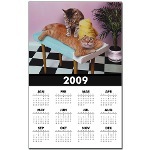 I recently did a Google Image search on the term “Massage Cats”. The first page gave me eighteen results, eleven of which featured my image, and ten of those images were purloined! And the unauthorized uses (copyright violations) continued on page after page. I quit checking after ten pages. Some of the pages with my image on them offered the image as a print, for a price. 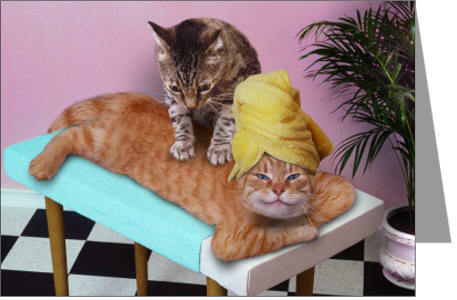 Some offered Massage Cats as an e-card. Some of the sites offered the image for Myspace use, website use and use on blogs! Some of the images had copyright notices from other people on them! 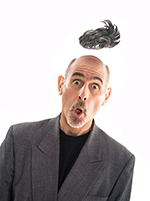 I’ve seen the image used on a number of business cards…usually for massage therapists. The image is all over flickr, but almost never is its creator (me) credited. Oh well…. If you want to use this image it is available as a greeting card through Marion Heath greeting cards, and on a wide variety of products from mouse pads to pet bowls and coffee mugs, on CafePress.com. As a stock photo the massage cat picture is available for licensing through the workbookstock brand on Gettyimages.com. 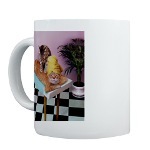 High quality prints can be ordered through Imagekind.com.